Freight rates across the board saw lower levels more or less all year, with trading into the US East Coast in the first four months of 2015 being the exception. The China Containerized Freight composite Index (CCFI), which covers ten major ports in China and includes long-term contractual rates in addition to spot freight rates, declined 19% in 2015, on average, from the year before. Trades into Europe declined 29% on average, while rates for ships bound for the US West Coast lost 8% on average from the previous year. In the spot market, the depressing development and the accompanying volatility in 2015 were, even more, apparent (see graph). 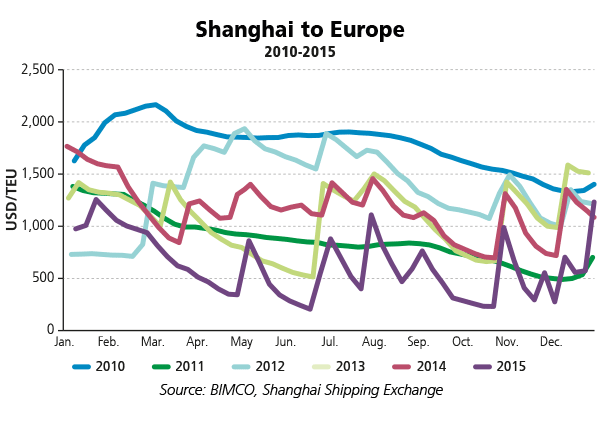 Spot rates on the Shanghai to Europe trade lost 47% on average from 2014-2015. As the deployed capacity in this trade is leading the industry up and down, growth in volumes needs to return. As this trade went into reverse in 2015, the redeployment of non-competitive ships into other trades hampered freight rates there as well. There is no way to hide it, nor any reason to. 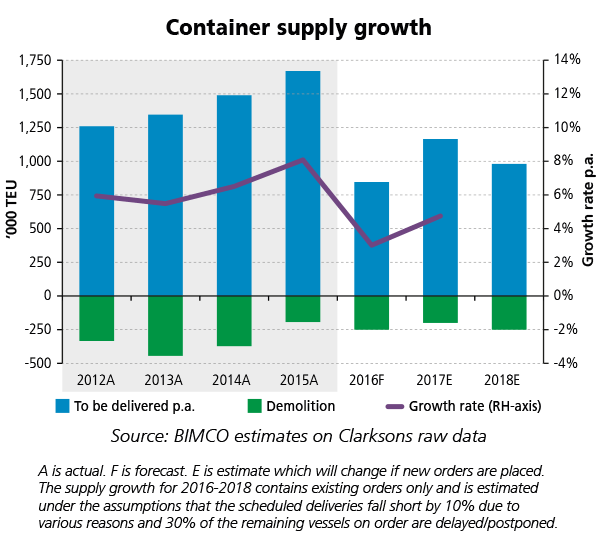 The fundamental imbalance of the containers shipping market worsened in 2015. While the demand side delivered only a sluggish growth level, the supply side jumped by an astonishing 8.1%. We are not making it easy for ourselves. No wonder the system of cascading broke down, as all trades were already awash with ships ready to be filled up with cargo but still sailing underutilised. 2015 saw the injection of 208 brand new ships with a combined transport capacity of 1.67 million TEU. The highest supply side capacity expansion ever, including 46 ultra-large containerships (more than 13,870 TEU), 66 feeders (up to 3,000 TEU) and 99 other ships with an average size of 8,160 TEU. Mercifully, 2016 is expected to bring around only 850,000 TEU of new capacity. Yet, it will be a year where all fleet growth will happen in the size-segments larger than 8,000 TEU, just as it has been the case every year since 2012. The only solace is that the work done by owners and investors managed to postpone the original agreed delivery dates. Over the past year, BIMCO estimates that the postponement rate of orderbook has gone up from 15% to 30% with most of the work done in the first half of 2015. 2015 saw a total of 2.1 million TEU of newbuild capacity being ordered. 2016 will see a lower level. Towards the end of 2015, the amount of idle capacity climbed to 1.36 million TEU (Alphaliner), only to go down again on the expectation that transport demand would go up prior to the Chinese New Year. That does not seem to be the case, as the demand primarily from Europe is not going anywhere for the time being. As goes for the permanent reduction of capacity, 2015 was not an upbeat year. 90 ships were sold for demolition, 2/3 being ships smaller than 3,000 TEU. A total of 193,156 TEU. What a difference a year makes, one year ago there was hardly any idling seen. As if the market was just about in balance with all ships ready for the anticipated cargo rush in January. Like it or not, the container shipping fleet can cater for a much higher transport requirement than it does today, without growing at all for a few years. The lower bunker costs are very welcome to an industry struggling to make a profit. The lower fuel price, however, may not be such a blessing, as some may have forgotten that slow-steaming originally was a way to deploy more ships without increasing capacity on the strings. As we have seen, even in the tramp shipping segments, speed has gone up now that the fuel is much cheaper. By mid-January 2016 HFO 380 cSt was quoted at USD 112 per tons in Rotterdam and USD 152 per tons in Singapore (Marine Bunker Exchange). This compares to USD 242 and 281 respectively one year ago. A drop in prices of 50%. We must get past the Chinese New Year celebrations taking place in the week of 8 February 2016 before export volumes can rise again. As demand for Chinese manufactured goods is weak, many factory workers have already started to go on holiday. We need European retailers and wholesalers to stop running down inventories and start importing containerised goods to a large extent again. The ongoing declining value of the Chinese Yuan against the US dollar may inspire some to go back to its Chinese suppliers for goods. Private consumption in Europe has been steady over the past year so eventually demand should come back. At what level and what time remains uncertain. What remains certain is “the sooner the better”. 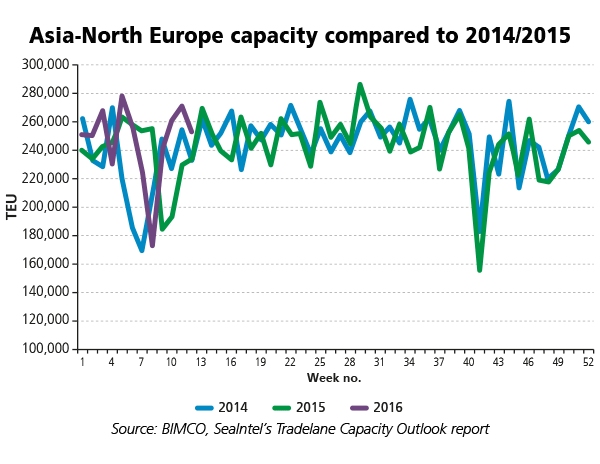 According to SeaIntel, deployed capacity in Asia to North European trades was down by 0.43% in 2015 from the previous year. For freight rates to rise, a return in demand is not enough, we need the supply side to support the fundamental balance too. BIMCO expects imports in the US to present an upside to the industry as the economy is constantly improving and demand from the consumer is very solid. Publicado el enero 25, 2016 en News. Añade a favoritos el enlace permanente. Deja un comentario.